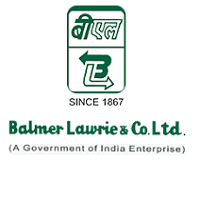 THE COMPANY Balmer Lawrie & Co. Ltd, a public sector company under the Ministry of Petroleum & Natural Gas, is a professionally managed, multi-location, diversified conglomerate having presence in manufacturing as well as services sectors, with a consistent track record of growth and profitability. High standards of customer service, innovative outlook and dedicated human resources have enabled the Organization to achieve leadership position in many of its businesses. PRODUCTS AND SERVICES The Company operates in various business segments through Strategic Business Units [SBUs] and Joint Venture Companies [JVCs]. It is the market leader in Industrial Greases & Specialty Lubricants, Steel Barrel, Corporate Travel and Logistics Services. The Company also has significant presence in most of the other businesses it operates in, namely, Refinery & Oil Field Services [ROFS], Leather / Performance Chemicals, Logistics Infrastructure, etc. Educational Qualification: Master Degree of a recognized university in Hindi with English as a subject at Graduation Level Or Master Degree of a recognized university in English with Hindi as a subject at Graduation Level Or Master Degree of a recognized university in any subject in Hindi medium with English as a subject at Graduation Level Or Master Degree of a recognized university in any subject in English medium with Hindi as a subject at Graduation Level. Educational Qualification: Diploma (Undergraduate - Engineering)-Chemical/ Petrochemical. (i) The mode of selection is through an All India Written Examination. (ii) 2nd Level of selection process, if the Company decided to do so. (iii) The examination shall consist of a single paper of 2 hours estimated duration having objective type multiple choice questions, which shall be conducted through Pencil-Paper mode. Candidates shall be required to carry pen, pencil, eraser, sharpeners and other necessary stationary on their person on the date of the Written Examination. (iv) Only short listed candidates who are found primafacie eligible based on the details given in the application form shall be called for the Written Test. The decision of the company is final in this regard. How to apply: Online submission of application is permitted on the website http://www.balmerlawrie.com/pages/currentopening between 0000 hours on 27.03.2019 till 2359 hours on 26.04.2019.